A horrifying suspicion takes root in my head and a wave of dizziness sweeps through me as I realize that there is only one possible reason that he is here. The only explanation that makes sense is that he wants to be the one to throw me out into the street. Somehow he’s in control of Stephen and Celine’s house, and I just bet he’d done whatever he had to do to get himself into this position. Four and half years he’d been waiting for a shot at me, and now he has it. “You’re… throwing me out?” I try, damn hard, to keep from breaking down. The tears I keep at bay, but there is a definite warbling of my voice as I ask the question. Immediately I am angry with myself for showing such weakness and I decide to take the bull by the horns. I am not about to give Killian Brandt, of all people, the pleasure of seeing me break, even though I have to admit to myself that I am definitely breaking. I plow on before he can answer my ridiculous question. I am so shocked by the force behind his words that I immediately drop back onto the couch. I don’t actually fear Killian, but my response to his tone of voice is instantaneous. For one moment, I allow myself to hope that maybe Killian isn’t here to ruin my life. Maybe, just maybe, he isn’t as bad as I think he was. Whatever I thought before? It was all too generous. Killian just turned my life upside down with nine life-changing words. The look he gives me is a lot like a warning and instinctively I know that whatever he says next isn’t going to be good. 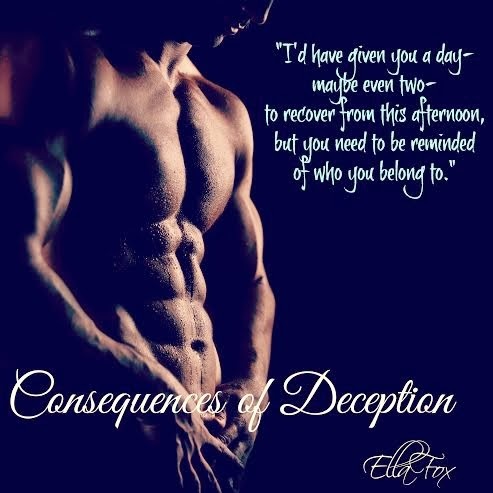 I’ve not read a book by Ella Fox before – what a mistake – she’s now completely on my TBR ! This book gripped me from the very start. Life was good for Sloane and was about to get better as the love of her life Killian had promised her when she turned 18 they would be together. Fast forward 4 and a half years and her life is somewhat different. I spent the next few chapters trying to work out what had gone wrong (as I am impatient) but no….Ella will only unweave this tale as she sees fit! I actually loved the suspense and the story unraveling, never quite guessing the next stage until I came upon it. He’s been hurt and has a wall around him a mile high, he wants to let Sloan in but doesn’t trust her, or anyone, so he tries to claim her instead. Going against all of her instincts Sloan fights but can’t resist the lure of her first and only love. Little do they know that the last 4 years they’ve been apart has been caused by a web of lies and deceit and the consequence of this deception may not be just their relationship but their lives. The 2nd half of the book you literally need a seat belt! Buckle in readers, this is one hell of a ride. I’m sad to say I read this book in one sitting, sad because I’ve finished it now…..ashamed – no way!!! !